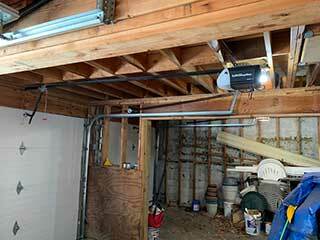 “If it ain’t broke, don’t fix it” applies to a lot of situations, but not to automatic garage doors. Professionals recommend that you have your door tuned up every six to twelve months – this will help to ensure parts remain oiled, the sensors stay aligned and potential problems caught preemptively. Our team will be happy to lend a hand. Whenever you open or close your door, you place mechanical stress on the panels, hinges, and other moving parts and eventually this leads to wear and tear. We’ll check your springs and belts for signs of cracking or fraying, and apply a fresh coat of lubrication to keep the grinding to a minimum for the coming months. If your opener’s motor starts to wear out, we can catch it ahead of time and prevent a catastrophic breakdown. The biomimicking sensors that prevent your garage door from closing when there’s something beneath it are prone to sliding out of alignment or accumulating dirt over time. If the sensors aren’t facing each other head on, or if their lenses are obstructed, your door can start closing when it would be dangerous for it to close, or refuse to close at all. We’ll clean your sensors and make sure they aren’t out of position. Electrical wires are an obvious failure point for automatic garage doors, especially if your system has a lot of exposed wiring. We can make sure your connections are tight and that your insulation isn’t coming off – we'll also look for possible sources of water damage and plug them up. If you're working with a 'smart” system or an intercom, it's even more important for wiring to be checked. A garage door system can fail in any number of ways - the more sophisticated your rig is, the more things there are that can go wrong. Our experienced technicians have seen it all, and no matter what kind of system you have, our technicians can be counted on to go over every component and give it a much needed tune-up. Why wait? Call us today!